The Womb Chair continues to be one of the most recognizable representations of mid-century modernism. The neo-futuristic, organic form of the Womb Chair is synonymous with the sublime elegance. Despite the fact that the chair looks like a masterpiece of modern art, it is fully functional and very comfortable. Needless to say, he took up the challenge. However, Saarinen, who was always fascinated by materials and shapes, was keen to achieve the comfort of sitting through the form of the chair, rather than the depth of its cushioning. The final design came into the limelight in 1946. Well received by the critics and public, the Womb Chair was an instant success. 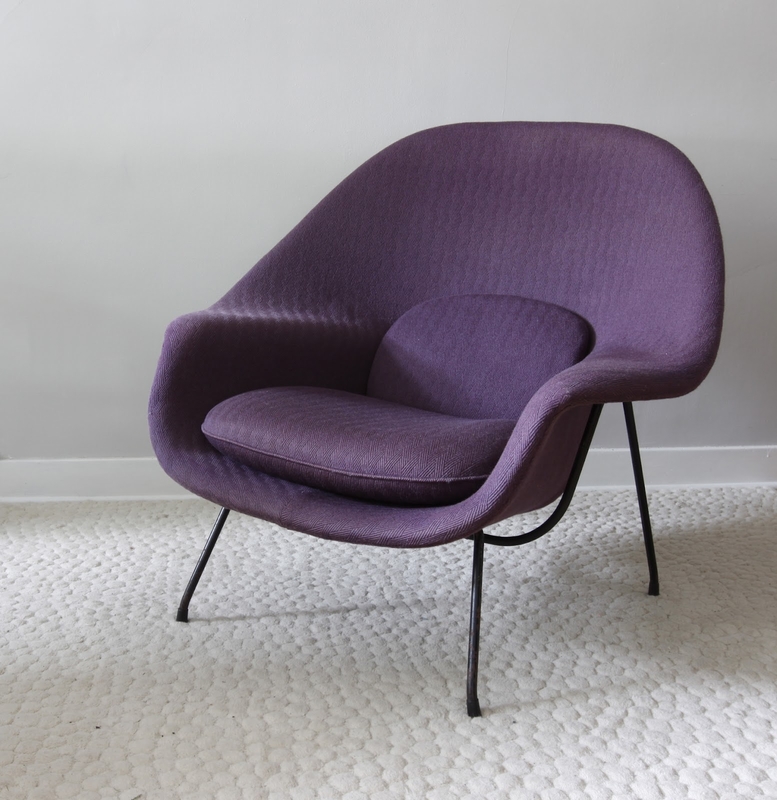 It is still commercially available and it is manufactured under the Knoll brand since 1948. The high level of comfort can be attributed to the high-density foam, which is then covered in the KnollTextiles fabric upholstery, available in three different variants: Classic Bouclé (52% wool, 48% nylon), Cato (86% wool, 14% rayon) and Sonnet (100% polyester). Although the original briefing mentioned “a basket full of cushions”, the actual chair has just two cushions placed on the seating pan and the back rest. The shell is fixed to the four-legged base made from the bent steel rods, equipped with the stainless steel and nylon glides at the ends. The base is finished with the chrome coating. In order to reach the absolute heights of comfort and relaxation, customers can combine the Womb Chair with the matching ottoman. Produced utilizing the same materials and processes, the ottoman is a perfect supplement to the chair. Summing up, the iconic design of Saarinen and Knoll not only caters to one’s physiological needs, but it also appeals to the most sublime tastes of any aesthete. Its cutting-edge futuristic design, combined with the impeccable quality of craftsmanship, has earned the chair a very special place in the interior design history. Produced since 1948, the Womb was the first mass-produced fiberglass chair in America. Not only were the Womb Chair’s prototypes made by a boat builder, but also the first two years of the commercial production were carried out there as well; as it was the only company able to produce the complex, organic form of the Womb Chair. Saarinen is mostly known for his architectural designs, rather than furniture designs. He worked as an architect on the following structures: the Gateway Arch, the TWA Terminal at John F. Kennedy Airport, New York and the Kresge Auditorium at MIT. The chair can be seen in a multitude of cinematic productions, including: The Moon is Blue, Legally Blonde, Torch Song and Down with Love.